After seeing the homeless on the streets of Chicago, former police officer Lisa Nigro decided that those who society had cast out deserved a little dignity and respect. Her solution was Inspiration Cafe, her nephew's red wagon which she filled with sandwiches and coffee and pulled around the Uptown neighborhood of Chicago, offering hope to the homeless men and women she saw. As Lisa's early supporters grew, Inspiration Cafe expanded from the red wagon into a van that had been converted to a kitchen on wheels. Soon after, they moved into a bus that had been converted into a traveling cafe. The Inspiration Cafe, which drove through the Uptown neighborhood serving food and hope to the homeless, soon attracted the attention of the Chicago media. An Uptown building owner, touched by her work, offered her a six-month lease on a storefront for one dollar. 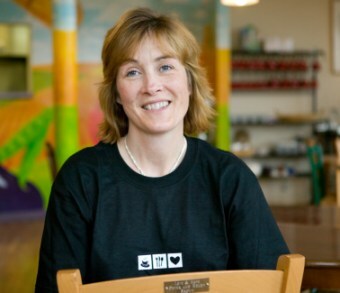 When The Inspiration Cafe moved into the storefront, Lisa had already decided that the homeless people who came in for a meal should be able to sit down and eat with the same dignity that customers in other restaurants do. Therefore, the Inspiration Cafe would not be a soup kitchen, but an actual restaurant. The employees and volunteers who plan the meals usually offer more than one option, so people who come for a meal have the experience of looking at a menu and giving their order to a server, just as regular restaurant patrons do. The cafe is mostly run by volunteers, who are responsible for planning, cooking, and serving the meals, and cleaning up, and who have collectively served more than 2,500 people each year. Over the course of the next few years The Inspiration Cafe expanded its services to include housing, training programs, and job placement to help the homeless become self-sufficient and move off the streets and into a home. Other organizations, inspired by Lisa's work to help the homeless, started their own organizations in Chicago to help those affected by homelessness and poverty. A former intern at The Inspiration Cafe started The Living Room Cafe, which provided meals and services to Chicago's south side. 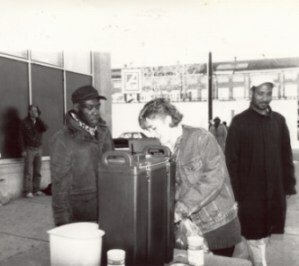 The two organizations worked side by side to reach out to all of Chicago's homeless population, and in 2005 they joined to form Inspiration Corporation. Later that same year, they opened a Cafe Too restaurant and training center, where culinary students could gain experience working in a real restaurant, so that when they enter the workforce they have the knowledge and experience to succeed. Today, they have three cafes, with approximately 75 employees and 800 volunteers, which provide meals, housing, supportive services, employment preparation, and vocational training to help people get back on their feet. Inspiration Cafe relies on private financial support and volunteers in order to provide assistance to the homeless of Chicago. You can help Inspiration Cafe continue their work by making a donation.